1. Camellia sasanqua – there are many varieties of this large evergreen shrub, many of which have fragrant flowers that bloom from late Autumn to late Winter. They can be grown in sun or shade and can handle any aspect. They require neutral to acidic soil and ideally should be protected from cold dry winds and the early morning sun to prevent the flower buds from turning brown. 2. Clematis cirrhosa var. 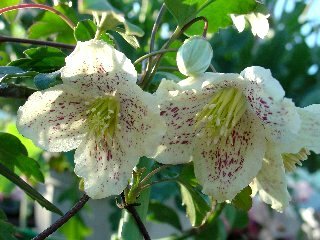 balearica – this is a fabulous evergreen climber with scented white speckled flowers that appear from December to February. It prefers well drained soil in sun or semi-shade and looks fabulous grown over an archway or doorway where the scent can really be appreciated. 3. Daphne odora – this gorgeous shrub is slow growing, but well worth the wait. It has clusters of sweetly scented pale pink flowers which appear from December to March. For added interest, try ‘Aureomarginata’ which has dark green leaves with yellow margins. It thrives in a sunny sheltered position and is best located next to a path or entrance where its intoxicating fragrance can really be appreciated. 4. 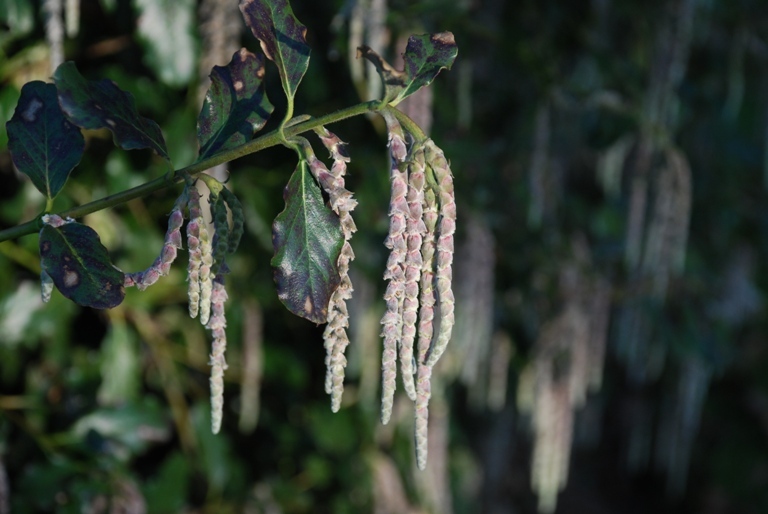 Garrya elliptica – This is a really fabulous shrub that looks brilliant towards the back of a sunny border or against a wall. As well as its dark foliage, which makes a lovely backdrop for summer flowering shrubs, it has long silvery catkins that shine out among the dark green leaves throughout Winter. 5. Hamamellis x intermedia – This is a deciduous tree-like shrub which has wonderful Autumn colour and then bears clusters of sweetly scented flowers from the bare twigs in January and February. Some varieties have yellow flowers but others have vibrant orange/red. 6. Sarcococca confusa – A small evergreen shrub which doesn’t look much but has the most gorgeous vanilla scented inconspicuous flowers from December to March that take your breath away. The flowers are followed by small black berries. Requires shade and will grow in deep shade, so an excellent choice for a North Facing front garden. 7. 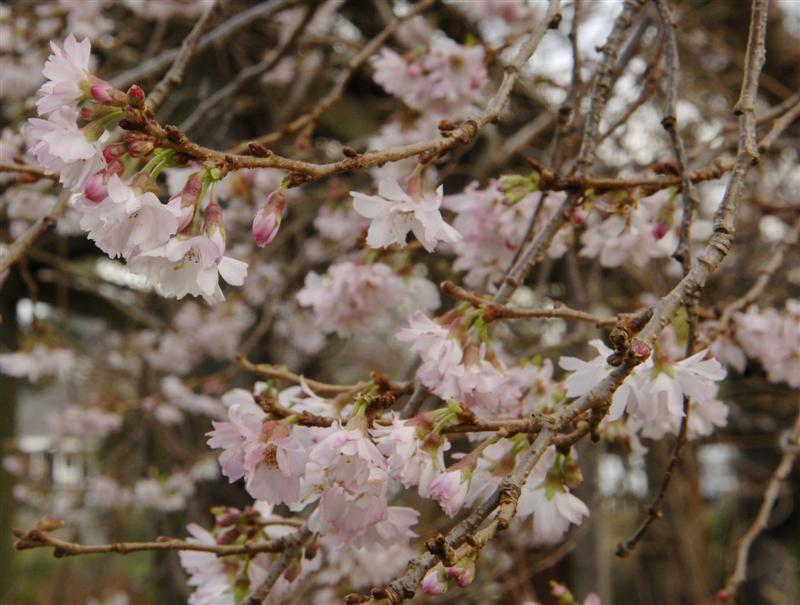 Prunus subhirtella ‘Autumnalis’ – A stunning tree for the Winter garden. It has tiny white flowers which continue to bloom sporadically throughout the Winter. It makes an excellent tree for a small sunny garden. 8. Helleborus niger – The flowers of this hellebore appear on short stems from January to April. They are predominantly white but sometimes flushed with pink and, unusually for hellebores, are usually upturned rather than nodding. They are best planted in groups at the front of a partially shaded mixed border, or beneath deciduous shrubs among spring-flowering bulbs. 9. 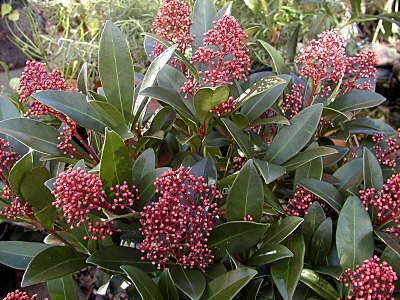 Skimmia japonica ‘Rubella’ – This is a compact male shrub with red-margined, deep green leaves. Technically it doesn’t flower until the Spring, but its dark red flower buds, produced in Autumn, provide interest throughout the Winter. Needs a shady/semi-shady position and prefers a well-drained soil. 10. Lonicera purpusii – Clusters of white flowers cling to bare branches in the depths or winter and fill the air with a wonderful fragrance, so choose a location where you can make the most of it. This honeysuckle is best planted among shrubs that provide interest over the Summer months as it looks rather insignificant once its green leaves appear. A good tip as usual Claire – thanks! Thanks Fiona. Sorry to hear that you haven’t had any luck with Daphnes – they have such a heavenly scent. They prefer a warm sunny sheltered spot but like their roots to stay cool in free-draining soil, so it’s best to underplant in order to keep the soil from getting too hot. Most varieties require lime-free soil, but there are some exceptions. Hope this helps!? I’ve 2 Daphne planted where there used to be a lime quarry one is acid loving (I don’t think it knows that it shouldn’t be) the other one is alkaline loving! They’re both doing very well. I can’t explain it. Sometimes things just can’t be explained Lily, but glad you’re having success growing them – the scent makes their slow growth rate well worth the wait!